"My mother-in-law introduced me to this and it kinda stuck. I am from Iowa, now in Kentucky, and the only way I can get this is by making it at home." Thaw out frozen bread dough; cut each roll into 3 pieces and set aside. Brown beef and cabbage in a large skillet, seasoning with salt and pepper to taste. Roll out bread dough and cut into squares. 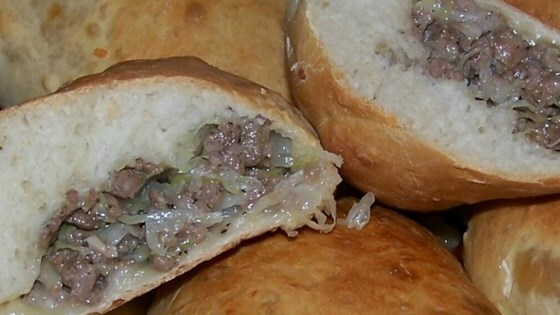 Place a spoonful of the beef/cabbage mixture onto the center of each dough square. Sprinkle cheese on top, fold over and pinch sides to seal. Rub a bit of oil on the outside of each pastry. Place in a 9x13 inch baking dish and bake in the preheated oven for 45 to 60 minutes, or until golden brown. Try this authentic German meat-filled pastry for a light dinner or hearty snack. These were alright the first day. A little bland. Not very good reheated because the cabbage breaks down. good, but not as good as my mom's. definately better than the resturants in NE :) do add garlic and onion though.